Taxpayers are teetering on the brink of picking up some huge bills to bail out the banks. Somehow we have to make sure it doesn't happen. Following Thursday's emergency meeting between Mervyn King and the City's top bankers, we'd steeled ourselves for a multi-billion bail-out announced over the long Easter weekend. Despite mounting hysteria, that didn't happen. Phew. But we're certainly not out of danger yet. "Does the Bank of England think the Fed is stupid or that the actions of the ECB are stupid? They need to wake up to the fact that this is serious and they need to help - that's what we have a f**king central bank for." To which there's only one possible response: f**king central banks are not for doling out taxpayers' money. 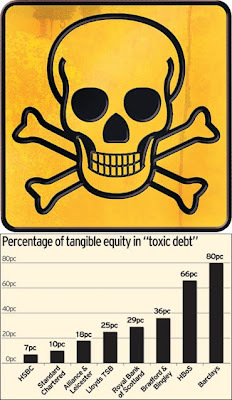 As we blogged here, there's a huge difference between the Bank lending against heavily discounted collateral - which it's certainly going to do more of - and outright purchases of dodgy loans (let alone toxic loans). The banks got themselves into this mess, and they should get themselves out of it. As we can see, it's been rolling along quite nicely in the range 20-30%pa, hardly dented even during the dotcom crash. These are highly profitable businesses. 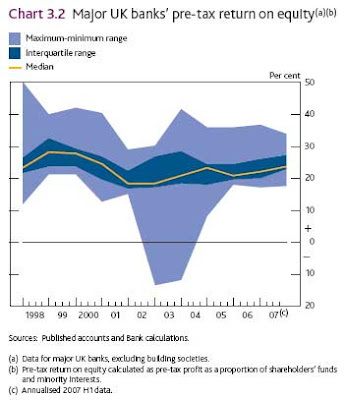 The key point here is that the real growth areas have not been in traditional bank business of taking deposits and lending (generating net interest income), but in fee earning and trading. The latter clearly involves dimensions of risk way beyond anything traditional banks did*, but even fee earning has brought whole new kinds of risk, many of the fees having been earned on the very financial innovations now causing so much concern. It's the banks and their shareholders who have profited from getting into these new businesses. And taxpayers should not be made to bail them out when the going gets rough. We reckon King is up for toughing it out. But Mssrs Brown and Darling? 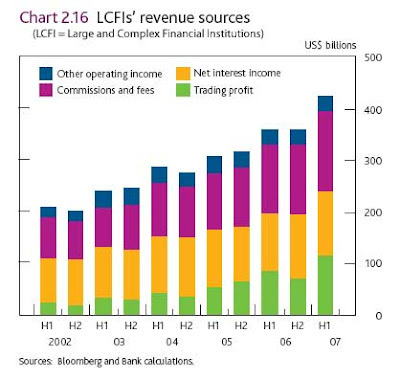 *Footnote- Do you know how these bank trading operations have made so much money? I expect you imagine it's because they employ genius rocket scientists and/or barrow boys who can just "do it". But that isn't the essence of it at all. Many of those profits have come from banks borrowing money cheap, and then placing highly risky bets that pay off most of the time. A simple example is the so called "yen carry trade": there, you borrow yen, which carries a very low interest rate, you invest in some currency (typically dollars) that has a much higher interest rate, and you sit there quietly earning the difference. If you're lucky, the yen also goes down against the dollar because it has such low interest rates, so you make an extra profit on top. Brilliant. Well, brilliant until the yen goes up against the dollar that is. Then, everybody dives for the exit at the same time, and you make a thumping great foreign currency loss. Most of the time, it's a regular money machine, but every now and again, in some entirely unpredictable way, it incinerates your face: don't try it at home. (Actually, it's a bit more complex than that, but the essence- investing in risky assets that are OK most of the time- is correct; and we're now in one of the periods when it's gone horribly horribly wrong: see also this outstanding blog by Martin Wolfon hedge funds and its link to this).